Employee well-being is important to ensure a successful and upbeat office environment. According to Forbes, “Employees are overworked, stressed and also afraid of the consequences this would have on their employment relationship.” When employees feel stressed and overworked, they tend to pull back and won’t perform their best work. Coming back from a holiday break, you may think staff will feel relaxed and motivated but they likely feel overwhelmed and stressed. When staff return to their desk to a crowded inbox and endless to do list they go into a fight or flight reaction, both of which can result in poor work performance. 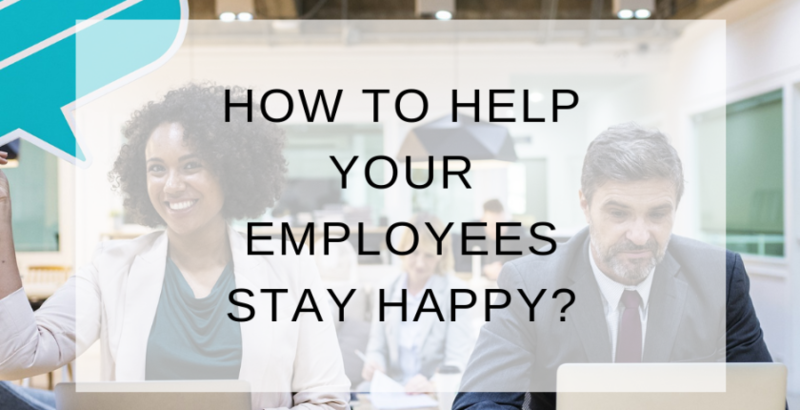 So, the question is, how can I help my employees to stay happy at work, especially during a busy or stressful period? People learn best from example. Set a good example for how to handle stress and approach staff if you see them on a downward spiral. Be empathetic towards your employees. Talk to your employees about what they want out of their job. We spend a lot of time at work, and it can really boost morale if employees feel they are being looked after and they are valued in the office. The longer an employee is with you, the more responsibilities they have likely taken on, and it is often overlooked. The best way to gauge if you are understaffed is to do an audit on your employees’ workload. If you notice your employees are not as happy or productive as usual, ask them to write their daily and weekly tasks then go over it with them. You may find that they are overworked, and your office may be understaffed, unbeknown to you. As humans it is in our nature to respond well to praise and rewards. Think about the last time you thanked your employees for their hard work or offered a reward when a goal was met. It is something that is simple yet effective at boosting morale and motivation in the office. Click to learn more ways to stay productive at work.